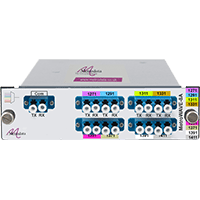 The MetroWAVE product range offers a series of passive CWDM optical multiplexing functions allowing a range of totally independent applications to be converged over a singlemode fibre pair. Each application operates at a different wavelength with the MetroWAVE multiplexers optically combining these together for transmission and then separating them back out again at the other end of the fibre. CWDM multiplexing is a technique whereby different wavelengths of light are multiplexed together and transported over a singlemode fibre pair then demultiplexed at the far end, back into their original wavelengths. This is an extremely simple way of performing a sophisticated convergence function without needing to resort to complex technology. Convergence simply becomes a matter of fibre plumbing. The MetroWAVE product range has the advantage of performing the CWDM multiplexing and demultiplexing functions passively, i.e. directly optically without using any conversions to electrical and then back to optical. This means that the MetroWAVE products are completely unpowered devices, which means that they have much greater robustness and reliability than active devices performing similar functions. The widespread availability of vendor compatible CWDM SFPs means that the optical-electrical-optical conversion process performed by active CWDM equipment is no longer required. The MetroWAVE-9S product operates in the upper 1550nm CWDM band with support for the lower 1300nm CWDM band via a wideband 1300nm port. This means that they can support direct connection of legacy 1300nm non-CWDM equipment, or alternatively expansion into the lower 1300nm CWDM band. The MetroWAVE-8A offers lower CWDM band expansion capability, so in conjunction with the MetroWAVE-9S, solutions offering up to 16-wavelengths of CWDM can be supported. The MetroWAVE-CWDMmeter allows all 18 off CWDM channels to be monitored simultaneously, which when used in conjunction with the monitor ports enables easy but sophisticated system level debug. Whilst the MetroWAVE product range is compatible with industry standard user exchangeable SFPs, it is recommended that these are purchased from Metrodata for use in Metrodata fibre equipment to guarantee their specification and compatibility with each other. Metrodata can also supply a wide range of vendor compatible fibre transceivers for use in your routing, switching or SAN infrastructure including SFP, SFP+, XFP, X2 and XENPAK including long distance, CWDM and DWDM variants, or 40G QSFP+. 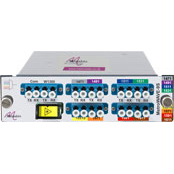 The MetroWAVE product range offers a series of passive CWDM optical multiplexing functions allowing a range of totally independent applications to be converged over a singlemode fibre pair. Each application operates at a different wavelength with the MetroWAVE multiplexers optically combining these together for transmission and then separating them back out again at the other end of the fibre. Different protocols with different data rates can be supported. Monitor ports can be used in conjunction with the MetroWAVE-CWDMmeter to check whether all applications are present, without disturbing the operation of the live system. 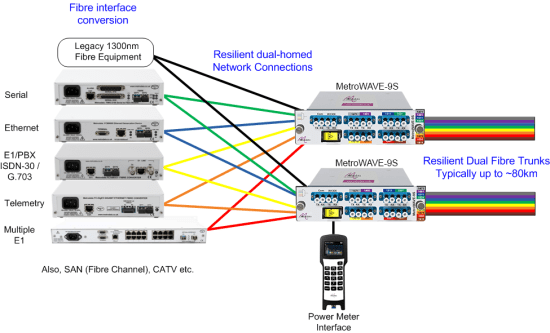 The following specifications relate to the various MetroWAVE CWDM multiplexing units. Whilst Metrodata's fibre product ranges use industry standard user exchangeable SFPs, it is recommended that these are purchased from Metrodata to guarantee their specification and compatibility with each other. For all fibre transceivers including vendor compatible SFP, SFP+, XFP, X2 and XENPAK transceivers, with long distance, CWDM or DWDM specifications, or 40G QSFP+, then please contact our Sales Team with your requirements.